Fëanor (IPA: [ˈfɛ.anɔr]) is a fictional character from J. R. R. Tolkien's legendarium who plays an important part in The Silmarillion. He was the eldest son of Finwë, the High King of the Noldor, and his first wife Míriel Serindë. Fëanor's mother, Míriel, died shortly after giving birth, having given all her strength and essence to him. For Fëanor was made the mightiest in all parts of body and mind: in valour, in endurance, in beauty, in understanding, in skill, in strength and subtlety alike: of all the Children of Ilúvatar, and a bright flame was in him. Finwë remarried, and had two more sons, Fëanor's half-brothers Fingolfin and Finarfin, and two daughters, Findis and Írimë. Fëanor is best known as the creator of three gems, the Silmarils, which figure prominently in The Silmarillion and are mentioned briefly in The Lord of the Rings. His name is a compromise between Faenor (in Tolkien's fictional language of Sindarin) and Fëanáro, meaning "Spirit of fire" (in Quenya, another of Tolkien's invented languages). He was originally named Finwë or Finwion after his father and later Curufinwë ("Skilful (son of) Finwë"). Fëanor wedded Nerdanel daughter of Mahtan, who bore him seven sons: Maedhros, Maglor, Celegorm, Curufin, Caranthir, Amras, and Amrod. Fëanor was the student of his father-in-law Mahtan, who was himself a student of the Vala Aulë. He was a craftsman and gem-smith, inventor of the Tengwar script. He also was the creator of the palantíri[note 1] (a feat which is said by Gandalf to be beyond the skill of both Sauron and Saruman), and was said to have created the Elfstone in one version of its history. Fëanor, at the pinnacle of his might, "in the greatest of his achievements, captured the light of the Two Trees to make the three Silmarils, also called the Great Jewels, though they were not mere glittering stones, they were alive, imperishable, and sacred." Even the Valar, including Aulë, could not copy them. In fact, Fëanor himself could not copy them, as part of his essence went into their making. Their worth, in Tolkien's universe, was close to infinite, even to the Valar, as they were unique and irreplaceable. So "Varda hallowed the Silmarils so that thereafter no mortal flesh, nor hands unclean, nor anything of evil will might touch them, for it would be scorched and withered." Fëanor prized the Silmarils above all else, and grew increasingly suspicious that the Valar and other Eldar coveted them. Melkor, recently released from three ages of imprisonment in the Halls of Mandos and now residing in Valinor, saw in this suspicion an opportunity to sow dissension among the Noldor. Fëanor did not trust Melkor and refused to communicate with him, but was still caught in the evil Ainu's plot. Melkor used Fëanor's anger and pride against him, telling him that his own half-brother Fingolfin was planning to usurp his place as heir to Finwë. Fëanor threatened Fingolfin's life. (It was at this time that the Noldor, driven to distrust by Melkor's guile, first began to forge weapons, which would later be used against the Teleri.) As punishment for his threat, the Valar exiled Fëanor to Formenos. He took a substantial treasure with him, including the Silmarils, which he put in a locked box. In support for his eldest son, Finwë also withdrew to Formenos. The Valar then learned that Melkor was manipulating Fëanor, and sent Tulkas to capture Melkor, but he had already escaped. With Finwë and Fëanor's absence, Fingolfin had become king, and so it seemed that Melkor's lies were true. Melkor tried again to convince Fëanor of them, but Fëanor realised that Melkor's true goal was to obtain the Silmarils, "and he shut the doors of his house in the face of the mightiest of all the dwellers in Eä." In a rage, Melkor left. The Valar invited Fëanor and Fingolfin to Valinor to make peace. Fingolfin offered a hand to his half-brother, recognising Fëanor's place as the eldest. He gave his pledge to follow his elder brother and Fëanor accepted. Meanwhile, Melkor went to Avathar in the south of Aman to seek out Ungoliant. The monstrous spider helped Melkor to destroy the Two Trees. Melkor and Ungoliant then went to Formenos, slew Finwë, and took the three Silmarils. They escaped by crossing the Helcaraxë, or Grinding Ice, in the north to Beleriand. The Trees were destroyed during the reunion of Fëanor and Fingolfin. The Valar, realising that now the light of the Trees survived only in the Silmarils, asked Fëanor to give them up so that they could restore the Trees. Fëanor said: "It may be that I can unlock my jewels, but never again shall I make their like; and if I must break them, I shall break my heart." And it was after this that he stated that he would not give up the Silmarils of his own free will; if the Valar forced him, he said, they would be no better than Melkor. Even then, however, he wavered, and some later believed that at this point it may have still been possible to convince him to change his mind. However, messengers from Formenos then arrived and told that Finwë the High King of the Noldor had been killed by Melkor (and so was the first Elf to be slain in Valinor). Melkor had then stolen the Silmarils, as well as the other lesser jewels Fëanor had created. Without the living light from the Silmarils, Yavanna could not heal the Two Trees. The Valar and Eldar now fully understood the extent of Melkor's treachery. Fëanor, upon learning of his father's murder and the theft of his prized Silmarils, named Melkor "Morgoth", or "Black Foe of the World" (literally "Black Enemy"). Now King of the Noldor in Tirion, Fëanor delivered the most impassioned speech ever given in Arda, which he unwittingly filled with Morgoth's corruption. He railed against the Great Enemy, but because of Morgoth's influence, he also blamed the Valar for Morgoth's deeds. He persuaded most of his people that because the Valar had abandoned them, the Noldor must follow him to Middle-earth to wrest the Silmarils back from Morgoth and avenge Finwë. He declared that even if the Noldor ever managed to recover the Silmarils, he would never give them to the Valar to help recreate the Two Trees. Fëanor then swore an oath which all seven of his sons also proclaimed, vowing to fight anyone and everyone — whether Elf, Man, Maia, or Vala — who withheld the Silmarils, swearing upon Ilúvatar himself, and invoking the chief of the Valar and the mountains of Valinor themselves as witnesses. This became known as the Oath of Fëanor and, later, the cause for great tragedy on Middle-earth, particularly among his seven sons. The oath commanded Fëanor to press to Middle-earth and resulted in the first Kinslaying at the havens of the Teleri. Fëanor died soon after his return to Middle-earth but the remaining oath-takers, his sons, lived on in relative harmony with the Eldar of Beleriand. For the greater part of the First Age the oath kept the sons of Fëanor united in one cause to defeat Morgoth and retrieve the jewels. However, the true dangers of the oath became apparent when the lovers Beren and Lúthien recovered one of the jewels from Morgoth, which ultimately came into the possession of Dior, their son, who ruled after his grandfather Thingol in Menegroth. The presence of the Silmaril awoke the oath and caused the brothers to make war on the Elves of Doriath because Dior refused to yield the jewel. The brothers attacked Doriath, killed Dior and sacked the halls of the Sindar, committing the second Kinslaying. However, the Silmaril escaped the destruction of Doriath and the oath drove the sons onwards. When they learned that it was possessed by Elwing daughter of Dior, who dwelt near the mouths of Sirion together with exiles from Doriath and the city of Gondolin, they attacked the place (after Elwing also refused to return the Silmaril to them), committing the third and most terrible Kinslaying. All six of the remaining brothers survived even the complete rout of their forces at the Nírnaeth Arnoediad, but three of the brothers — Celegorm, Curufin, and Caranthir — died in the second sacking of Menegroth. At the third and final Kinslaying, Amras was slain. The fate of another brother, Amrod, varies by source. In the published Silmarillion, Amrod dies at Sirion with his brother. In subsequently published material, he dies much sooner as part of an accident that occurs when his father burns the stolen Teleri ships at Losgar. But the Silmaril escaped them again and was borne by Eärendil into the West. That Silmaril was lost to the sons of Fëanor but two more remained inside the crown of Morgoth. So after the War of Wrath the two remaining oath-takers, Maedhros and Maglor, stole the two Silmarils from the camp of the victorious West (the other five brothers were dead by this time). However, due to the terrible deeds committed by the brothers in their retrieval of the Silmarils they found they could not handle the Silmarils without enduring searing pain. The two brothers parted: in their anguish Maedhros threw himself and his Silmaril into a fiery chasm, and Maglor cast his Silmaril into the sea. Maglor would spend eternity wandering the shore, lamenting his fate (though in Tolkien's final words on the subject, Maglor cast himself with his Silmaril into the sea). Tolkien wrote at least four versions of the oath itself, as found in The History of Middle-earth. The three earliest versions are found in The Lays of Beleriand: In alliterative verse (circa 1918 - 1920s), in chapter 2, "Poems Early Abandoned". The Flight of the Noldoli from Valinor. Lines 132-141. In rhyming couplets (circa 1928), in chapter 3, "The Lay of Leithian". Canto VI, lines 1628-1643. In a different form as restated by Celegorm, third son of Fëanor, in chapter 3, "The Lay of Leithian." Canto VI, lines 1848-1857. A later version is found in Morgoth's Ring. Seeking a way to get to Middle-earth, he went to the shores of Aman, where the seafaring Teleri lived, and asked for their aid. When Teleri refused to give or lend their ships, Fëanor ordered the Noldor to take the ships. The Teleri resisted, and a battle broke out, in which many of them were slain. The battle became known as the Kinslaying at Alqualondë, or the first kinslaying. His sons would commit two other acts of warfare against elves in Middle-earth in his name. In repentance for this act, Finarfin, Finwë's third son, took his host and turned back. They were accepted by the Valar, and Finarfin ruled as High-King of the Noldor in Valinor. The remaining Elves, those who followed Fëanor and Fingolfin, became subject to the Doom of Mandos. There were not enough ships to carry all of the Noldor across the sea, so Fëanor and his sons led the first group. Upon arriving at Losgar, in the land of Lammoth, in the far west of Beleriand, where Morgoth and Ungoliant had passed not long before, they decided to burn the ships and leave the followers of Fingolfin behind. However, Fëanor's son Amrod died at Losgar, having been accidentally burnt with the Telerin ships. The remaining Noldor saw the flames, and perceived that if they were to go to Middle-earth, they had no choice but to cross the Helcaraxë. Unwilling to return to Valinor, they did that under the leadership of Fingolfin, and suffered great losses along the way, which greatly added to the animosity they had for Fëanor and his sons. Learning of the Noldor's arrival, Morgoth summoned his armies from his fortress of Angband and attacked Fëanor's encampment in Mithrim. This battle was called the Battle under the Stars, or Dagor-nuin-Giliath, for the Sun and Moon had not yet been made. The Noldor managed to win the battle, and destroy Morgoth's armies. Fëanor, still in a great rage, pressed on toward Angband with his sons. He came even within sight of Angband, but was ambushed by a force of Balrogs, with few elves about him. He fought mightily, hewing even after receiving several wounds from Gothmog, captain of the Balrogs. His sons came upon the Balrogs with a great force of elves, and were able to drive them off. However, as Fëanor was being escorted off the battlefield, he knew his wounds were fatal. He cursed Morgoth thrice, but with the eyes of death, he knew that his elves, unaided, would never throw down the dark towers of Thangorodrim. Nevertheless, he told his sons to keep the oath and to avenge their father. At the moment of his death the passing of his fiery spirit reduced his body to ashes. His sons were still bound by the Oath to recover the Silmarils, which would determine the events of Middle-earth during the First Age. According to Mandos' prophecy, following Melkor's final return and defeat in the Dagor Dagorath (Battle of Battles), the world will be changed and the Silmarils will be recovered by the Valar. Fëanor will be released from the Halls of Mandos and give Yavanna the Silmarils. Depending on the version of the story, either she or Fëanor will break them, and Yavanna will revive the Two Trees. The Pelóri Mountains will then be flattened and the light of the Two Trees will fill the world in eternal bliss. 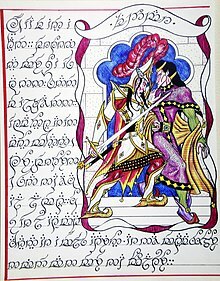 Elizabeth Solopova suggests that the character of Fëanor was inspired by Byrhtnoth from the Anglo-Saxon poem "The Battle of Maldon" who is slain in battle. Tolkien has described Byrhtnoth as misled by "pride and misplaced chivalry proven fatal" and as "too foolish to be heroic", and Fëanor is driven by "overmastering pride" that causes his own death and that of countless followers. Fëanor is among those major characters whom Tolkien, who also used to illustrate his writings, supplied with a distinct heraldic device. Blind Guardian's song "The Curse of Fëanor", featured on the album Nightfall in Middle Earth, tells of Fëanor swearing to go after Morgoth. The Russian power metal band Epidemia has a song entitled "Feanor", which is about the character's campaign against Morgoth and his death. ^ The Silmarillion mentions that Fëanor created crystals that "wherein things far away could be seen small but clear, as with the eyes of the Eagles of Manwë": the index points the reader at this passage when looking up palantíri. ^ "Palantíri". The Encyclopedia of Arda. Mark Fisher. 28 April 2008. Retrieved 30 August 2012. ^ "Of Fëanor and the Unchaining of Melkor". The Silmarillion. ^ a b "Of the Silmaril and the Unrest of the Noldor". The Silmarillion. ^ "Of the Flight of the Noldor". The Silmarillion. ^ Hammond, Wayne G.; Scull, Christina (1995). J. R. R. Tolkien: Artist and Illustrator. Houghton Mifflin. ISBN 978-0-395-74816-9.